Update: It’s back up, 24 hours later, but the auto payment still isn’t posted. "Could not retrieve your information… Please try again later." 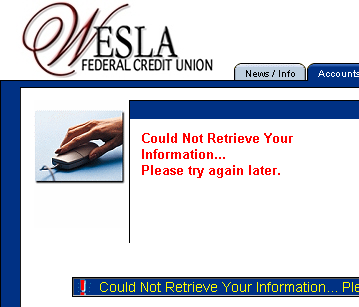 All I wanted to do was check to see if they had applied my auto loan payment I mailed Saturday. Well, I thought perhaps their online system was down or having trouble connecting to their database, and I couldn’t remember my "Touch Tone Teller" PIN to check via phone, so I called and pressed the option to speak with a loan officer. Me: Are you having an issue with your online banking? When I log in it says "Could not retrieve your information… Please try again later." Lady: Yes, our network is down right now. Me: Oh, ok. I just wanted to see if my auto loan payment that I mailed Saturday has been applied. Can you check for me? Lady: I can’t check that. Our entire network is down so I can’t access anything on the computer. Me: So if I wanted to come take my money out of the bank right now, could I? Lady: You can withdraw $200. That’s the limit. That doesn’t make me too confident in their ability to do business, but I just use them for a low interest auto loan right now, on which I’m making very successful, long strides in paying off early. In other news, my boss is taking Chris Leon and me to lunch tomorrow at Red Lobster! Yay! I love their cheese biscuits!